I am a big fan C. J. Busby's writing in this series thus far. It is very fitting of the time, playing a major role in setting the ambience for the whole book. The humour injected into the characters, especially Merlin and Caradoc the Bard, makes this book so lighthearted and that much more enjoyable. The heroes in the book are so lovable and the villains not so terrible that you enjoy every bit of the story. She mixed all the ingredients--a cup of adventure, a spoonful of humour, a sprinkle of magic, a dash of action and a pinch of luck--and voila! A perfect blend of story just right for your tastebuds. Can't wait to read the rest of the books in this series. I'm going to have to hunt down copies of the books to add to my personal collection at home. I would definitely like to re-read them. I'm currently reading the library copies. Max Pendragon is in two minds. While he is worried sick about attending Morgana Le Fey's Summer Spell School, he is also brimming with pride that the mighty Merlin has entrusted him with the task of keeping an eye on Morgana's evil schemes. Morgana is no ordinary enchantress and Max definitely doesn't want to let Merlin down. 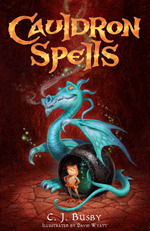 But what is one fledgling magician with a dented cauldron supposed to do?When his sister Olivia (the spirited knight-in-training), her pet dragon Adolphus (he of the slow wit but high exuberance) and his very own pet rat Ferocious (world-weary and wise as always) show up by his side, things may not be so bad for Max. And let's not forget the new and mysterious Bard called Caradoc. What is his game? Whose side is he on?All that and more in Cauldron Spells.The second instalment in the Spell series is even better than the first. The humour is intact and the characters are as entertaining as ever. Add to that, a healthy splash of magic, mystery and dark deeds and Max Pendragon is set for an adventure of a lifetime. I am really enjoying this series.Each book is short enough that I can zip through it quickly and yet, meaty enough to keep me engaged.Fun, adventurous and utterly enchanting. Well after reading the first book I was intrigued and as these books are so simple and short I thought I might as well read the rest of them. And I have to say I actually enjoyed book 2 more. I don't know if it's just because I know the characters now and feel more involved in the world but everything just seemed to flow better and happen quicker. Max is now on his way to spell school, a whole summer in Morgana's home and having to attend her lessons, Max is sure she is still out for revenge for him ruining her plot in the first book. And just as expected, things don't go as planned. Olivia comes along with Max but disguises herself as a boy so that she can attend Squire training, she's determined to be a Knight. Then they find out about another plot to harm Arthur and they must try to stop her and Hogsbottom before it's too late.There is a lot more magic in this book and everything seemed a bit more exciting and urgent and I really like Olivia, she is developing a lot as a character and I like her attitude. Strong and Confident and not afraid to go after the things she wants.I'm looking forward to seeing more from Merlin and Arthur as they aren't massively featured.Good for younger or reluctant readers and very fun. Sweet little stories full of magic. I have found that the second book in a series is often hard as it must live up to the expectations left by the first as well as leaving expectations for the next book. Fortunately, Cauldron Spell managed to do exactly that. Once again Max, Olivia, Ferocious and Aldophus go on a mission to save King Arthur. This keeps the adventure going, brings in suspence and mystery, and continues the same humour from the first book, making this a perfect second book to this series. By the end of the book, we’re pleased by the turn of events but know that the danger isn’t fully over and are very excited to know what will happen in the next book! While the characterization was thin, and I never really cared about any of the main characters, the plot was interesting enough to keep children reading, though the lead-in took 7/8 of the book and the wrap-up was a bit too quick and convenient. A good transitional reader for the 2nd/3rd grade crew, with slightly larger print and wider line spacing for easier reading. I'm currently reading this series to my 7-year old daughter and she is loving it. Some good references to the King Arthur mythology that we are able to discuss but it's at a level small children can enjoy. She's all excited for the next book. Okay, for a children's adventure story that I read in a few hours whilst nothing much else was going on at work. I'm a sucker for anything Arthurian. Another super cute magical/knight themed adventure about the siblings Max & Olivia. Enjoyable adventurous reads perfect for either gender. C.J. Busby - I wanted to be a children's writer from the age of about 10, but got distracted and became an anthropologist instead. I did fieldwork research in south India and then worked for ten years as an academic. I wrote my first children's book, Frogspell, while taking a break between jobs. The sequels, Cauldron Spells, Ice Spell and Swordspell are all now out and I'm working on a new trilogy, starting with Deep Amber which is out in March 2014. My books are fantasies, aimed at ages 7-10, with lots of humour and adventure. They are equally aimed at girls and boys - and grown-ups seem to quite enjoy them too!